In the prequel Prelude to Foundation, Isaac Asimov takes us back to see how psychohistory, the science that saved humanity, was born — and it's kind of a crazy ride. Knife fights, mustaches, and high-level math await! Prelude for Foundation begins about fifty years before the opening story of Foundation, as a 32-year-old Hari Seldon arrives on Trantor for his first visit (one that will ultimately last the rest of his life). He makes a minor stir when he presents his paper on psychohistory, which to him is still just a theoretical curiosity but to the various political factions on Trantor could be the key to cementing their power. In particular, Seldon attracts the attentions of the basically decent but woefully inadequate Emperor Cleon I and his scheming, mysterious adviser Eto Demerzel. Seldon insists psychohistory is fundamentally useless and is soon brusquely dismissed, but his troubles have only just started. The book settles into an episodic pattern from here on out, with Seldon looking for some vital clue to psychohistory, falling into an increasingly complex conspiracy, and then requiring Dors or Chetter Hummin to come to his rescue. Some of the plot contortions in Prelude to Foundation do rather push at the edges of one's suspension of belief, as they require someone as obviously brilliant as Seldon to be so continually gullible. (Of course, the greatest thinkers do sometimes have the least common sense, so perhaps this is not entirely unrealistic.) And yes, much like Foundation and Earth, the driving force of this book — Seldon's need to learn ancient history so he can figure out whether psychohistory is practical or not — does feel rather distressingly abstract, and it doesn't have nearly the same dramatic heft as the original Foundation stories, where all of Terminus could be crushed at any moment if they made a wrong move. And yet, I think Prelude to Foundation has a ton to offer, and it's probably the latter-day Foundation book I most enjoyed rereading for this series. What late-period Asimov lost in his ideas and plotting, he gained back to some extent in his world-building, and that's most obviously on display here. Imperial Trantor is probably the most complete world he ever created, and its various sectors that we get to visit — the Imperial Sector, Streeling, Mycogen, Dahl, and Wye — all feel like distinct worlds, each with their own strengths and weaknesses (mostly weaknesses, it must be said). Asimov also puts a ton of thought into how a world that's one big city could ever possibly work, and a lot of the ideas he put forward both seem plausible and are quite intriguing. There's also Hari Seldon himself. I don't mean to put words in the mouths of older fans, but I can certainly see why some might object to demystifying Seldon in this way, particularly since it's not entirely easy to reconcile Prelude to Foundation and Forward the Foundation with his portrayal in "The Psychohistorians." Still, I have to admit that I'm a fan of what Asimov does with him — after all, he was such a cipher in "The Psychohistorians" that he could barely even be considered a character at all, so almost any additional detail would rate an improvement. Seldon is a much more fun character to have as protagonist than, say, Golan Trevize, and it's interesting to draw parallels between Seldon and other crucial Asimov characters like Trevize, Salvor Hardin, Elijah Baley, and, ultimately, Asimov himself, which becomes particularly crucial to understanding what he's trying to do with the character in Forward the Foundation. Oh, and Prelude to Foundation features two or three of the most gleefully psychotic twists I've ever seen. But we'll get to them a little bit later. JW: I understand exactly why you had so much fun rereading this one, because for all its — well, not flaws, but perhaps mediocrities, Prelude absolutely has an energy and vitality that's missing from Foundation and Earth (and even from Foundation's Edge, to an extent). Some of that is just a consequence of its being a prequel — even The Phantom Menace feels fresh, regardless of its other qualities, simply because it gives us a look at characters and cultures we already know in their younger, livelier days. And some of it is that it's a prequel to this particular story: There's a constant tension present in the first Foundation books, especially the earliest stories (including "The Psychohistorians," actually), that comes from the simple fact that Terminus is struggling not to get wiped out by bigger and badder enemies. Here on Trantor, on the other hand, a half-century before the ink is dry on the first pages of the Encyclopedia Galactica, the mood is positively unconcerned with any notion so absurd as the downfall of civilization. There's business to be done, and sure, that includes intrigues and danger. But the collapse of everything humanity has achieved and the onset of a 30,000-year-long age of darkness? Fuhgeddaboudit. It's in the tone, too. Whatever his state of mind actually was, Asimov seems relieved and invigorated to be freed from the established Foundation story framework. One also senses that, whatever his fans might think, he's also thrilled to be delving into the life of maybe the character he loved best. OK, I have no evidence that Hari Seldon was actually his favorite creation. But as we've discussed so often, a typical Asimov protagonist is not the most affable personality you'll find on your bookshelf. Seldon, though — or Hari, rather; we really do get to feel like we're on a first-name basis with him in this book — Hari is one likable chap. Yup, a bit absent-minded from time to time, occasionally impatient, and (in a direct contrast to the near-arrogance of a Trevize or Salvor Hardin or Susan Calvin) frustratingly unconvinced of the worth of his work. But innocent and bright and friendly, and game for whatever challenges lurk ahead. His hands came down sharply to seize Seldon's lapels and jerk him upright. Seldon pushed away, instinctively it would seem, and his chair tipped backward. He seized the hands stretched toward him, his foot went up, and his chair went down. Somehow Alem streaked overhead, turning as he did so, and came down hard on his neck and back behind Seldon. Seldon twisted as his chair went down and was quickly on his feet, staring down at Alem, then looking sharply to one side for Marbie. [Hummin said], with an air of honest concern, "You've hurt that one badly." Seldon said, "I'm afraid so. If he had fallen a little differently, he would have snapped his neck." Hummin said, "What kind of a mathematician are you?" Yes, it turns out that on Hari's home planet, physical fitness — including intensive training in the martial arts — is de rigueur. So while, yes, as you mention, Hummin does save Hari (who admits that he couldn't have handled both ruffians on his own), it would do our mathematician hero a grave disservice if we made him sound completely helpless. Why do I like this scene so much? In another novel, by another writer, it might not be so startling; but Asimov was, let's face it, a total nerd (all the trim he got notwithstanding), and more or less kicked off this whole series with the words "Violence is the last refuge of the incompetent" — so to have his alter ego suddenly step up and crack some skulls is a refreshing delight, not least because the Hari Seldon we've come to know is a paralyzed old man whose wheelchair seems very nearly a part of him. Of course, Prelude's problems also start around this scene, with the appearance of Chetter Hummin. Gosh, how different things were in the 20th century, when being a journalist meant you might be hiding your identity as a superhero, and not that you were afraid getting an English degree would mean too much reading. But even if members of the news media did have more vaunted powers when Asimov created this character than they do now, Hummin's abilities nonetheless defy credulity. Hummin knows everyone; he knows everything. Everybody owes him favors, so he enjoys nearly unlimited influence in every quarter. And he's thoroughly ethical: He wants Hari to develop psychohistory so that the whole galaxy can have it, and not just those in power. He's like Andrew Sullivan, if Andrew Sullivan rode flying taxis instead of a bike and kidnapped academics instead of posting pictures of people's windows. Hummin convinces Hari — rather effortlessly — to abandon his former life on Helicon, remain on Trantor, and try to make psychohistory work. (At this point, it's just a set of equations that suggest that one could, given the right data, accurately predict the behavior of large masses of people. I like that — it's the sort of nuanced tidbit young readers ought to be introduced to, the idea that in high-level math, the first step is just to deduce whether it's even possible to solve a problem.) That Hari gives in so easily seems like a testament to how boring Helicon must be — but later on, Asimov has a relatively reasonable explanation for it. This is where the story jumps the rails a bit, though: I mean, in the real-life version of Prelude to Foundation, Hummin would get Seldon a spot at Streeling University, and Seldon would work really hard for two or three uneventful decades, and — voilà! Psychohistory. Or actually, in the real real-life version, he would die and then one of his successors would figure out psychohistory decades after that. But neither of these versions would advance the plot very much, so instead, Hari works on psychohistory at Streeling for a while, meets Dors Venabili, and then is shuttled into a series of misadventures that teach us about Trantorian society and him...well, something he could have figured out by looking at a globe and thinking for a second. The first of these takes him to Upperside, the surface of Trantor, which is pretty much just all roofs, since the planet is entirely covered in buildings and biodomes. The next adventure brings us to the cityplanet's Mycogen sector — certainly the most interesting of all the settings we get in the book, as it's populated entirely by a quasi religious culture with a history stretching waaaaay back into the early years of the Empire. AW: As you mention, the ostensible point of Hari's long journey through Trantor — in which he realizes Trantor's thousands of sectors represent a simple proxy for the rest of the galaxy, and thus allows him to come up with a way to solve the psychohistory problem — feels like an afterthought. It's probably the book's chief weakness, and one that it shares with Foundation and Earth, which also features a central mystery so abstract and forgettable that I always pretty much immediately forget what it was supposed to be. (They do both hinge on ancient history, which makes it all the more irritating when we don't really get the big juicy revelations one might expect.) Without a strong central idea to lend Prelude to Foundation its vitality, we're left with Asimov's storytelling — which is unusually fun and stylish here, I must say — and the cultures we visit to hold our interest. And, as you say, Mycogen is the highlight of the book. It recalls some mildly obscure cultures and characters from earlier Asimov works — the puritanical society with unmatched expertise in food and unusual names (even by Asimov standards) is deeply indebted to his excellent 1976 short story "Good Taste," while the forced removal of all hair recalls the similarly dysfunctional Sennor in The End of Eternity. Mycogen is an unpleasant place, particularly to someone like Asimov. It's sexually repressed, lost in empty mysticism, constantly afraid of acquiring knowledge, and — perhaps most disgustingly to Asimov — it refuses to talk about itself. It also feels unusually deadly for an Asimov world, as it really does feel like one wrong step or slip of the skincap could get Hari ripped limb from limb by the savagely puritanical Mycogenian horde. Mycogen also provides a grim final answer to the fate of Aurora, which Golan Trevize and his friends encountered as a wasteland full of feral dogs in Foundation and Earth. That was an ignominious enough end for the first Spacer world (not to mention the "birthplace" of R. Daneel Olivaw), but Mycogen is even more brutal for anyone who thought the Spacer worlds weren't beyond redemption. It's a grim thought that the Mycogenians have been hanging onto their long-dead past as the near-immortal, robot-assisted rulers of the galaxy for nearly 20,000 years. Honestly, as a fan, I would have loved to get a little more detail about how Aurora became Mycogen — when did they abandon robots? Why did they choose Trantor? When did their life spans drop back to normal human lengths? But then, I suppose Mycogen is Asimov's gentle reminder that you've got to let go of the past eventually, or else risk being consumed by it. If I have any great issues with the Mycogen section, it's the revelation of yet another perfect conspiracy that has stage-managed our hero to some predetermined end. Golan Trevize went through a couple of these in Foundation's Edge and Foundation and Earth, and neither was particularly satisfying, with R. Daneel's admission that he had guided him to Earth feeling particularly contrived. Here, the reveal that the Mycogenian leader Sunmaster Fourteen set up a massive conspiracy that included pretty much everyone Hari and Dors met just to get them to break the laws of Mycogen, so that he could have them executed...well, it just doesn't feel right. On the plus side, it does make Chetter Hummin's deus ex machina reappearance (or in his case, would that be a machina ex deo? *) feel slightly less contrived in its own right. But then, I think we should save our discussion of Mr. Hummin for a little later, as we've still got to get through the various sections. *That is quite possibly the nerdiest thing I've ever written. And believe me, it's up against some pretty stiff competition. JW: I just picked up the book again and realized how long the section is that I only briefly alluded to earlier, where Hari is at Streeling U and ends up going Upperside. I skipped over it because, frankly, it isn't that exciting. It serves to introduce Dors and to give us some insight into how the reasonably well-off on Trantor live, but much of the conflict arises from Hari's contentious relationship with a misanthropic meteorology professor, who ends up leaving the mathematician behind on Trantor's perilous surface (after Hari runs off when he bizarrely believes a "jet-down" aircraft is tracking him — like you noted earlier, a lot of the plot here depends on the future Father of Psychohistory acting like not much of a genius at all). Anyway, I mention the section now simply to note one ongoing frustration: Hari is hanging out with Jenarr Leggen, the meteorologist, in the hope that studying the chaos inherent in weather systems will provide some clue to how the ultracomplex math behind psychohistory might work. That's an intriguing notion, and one that rings true, as does a similar aside, in (I think) Foundation and Earth, when someone mentions that study of the motion of gases contributed to psychohistory's development. It would have been very unusual, I think, for Asimov to go much deeper into either of these ideas, so I'm not surprised he forsook them for the more pedestrian strategy of having Seldon study Trantor as a microcosm of the Empire; but a part of me will always yearn for a several-page Neal Stephenson–esque digression analogizing, say, the formation of a violent storm to a planetwide insurrection. Anyhoo, you nail it about the undercurrent of lethal danger running through the characters' time in Mycogen. There's a tense vibe, an odd cross between Amish insularity, Hasidic rigor, and, like, an Aztec eagerness for blood, and pretty much everything Hari does — especially when he's boldly addressing the Mycogenian women Raindrop Forty-Three and Forty-Five — you want to shout at him like he's in a horror movie: "DON'T GO THERE!" Hummin's sudden appearance at the end of the section to yank their asses out of the fire can't help but feel like a letdown, even though you sense it coming the whole time. And Hari and Dors's big discovery isn't remarkably thrilling either, since they sneak into the Mycogenian elders' aerie in the hope of finding a robot, and uh, do find a robot. AW: I think I've got to go ahead and drop the p-word for this book. Yes, Prelude to Foundation is that bane of all serious literature, a page-turner. And, let's be honest — this book isn't serious literature, and I don't think Asimov is even really trying for it to be. The original three books are all pillars of the golden age of science fiction, full of heady ideas mixed freely with often pulpy storytelling. Foundation's Edge is almost completely driven by competing ideas and is almost perversely committed to relating everything through lengthy conversations. We haven't gotten to Forward the Foundation yet, but it earns its larger merits on, if nothing else, its autobiographical qualities, and the fact that Asimov was trying to outrace his own death in order to finish it. These five can all be considered, for various reasons, to be important books. That just leaves Foundation and Earth and Prelude to Foundation. To be honest, neither feels like it has anything terribly important to say, something I'd say is reflected in just how impossibly abstract a lot of their mysteries and arcs really are, how hard it is to remember what the stated points of these stories are actually meant to be. The hand-on-thigh story is a good example — I read the relevant sections, I reread them, and I still don't really see why it's so awesomely significant. As you say, it feels like a weak fit for the realization that Hari needs to have about Trantor as small-scale model for the larger Empire. And that's the thing — in these two books, it just feels like this is a bunch of stuff that happened, and there's not really a larger point that Asimov is trying to make. These are shallow books. That's why it's so tricky to praise Prelude to Foundation — all its success is in spite of its basic emptiness. I can point to "The Mule" or "Search by the Foundation" and find stories that work on lots of different levels, many of which are in pleasing concert with each other. It's ironic for a book set almost entirely within the domes of Trantor, but Prelude to Foundation only works on the surface level. Its saving grace is that it's a really, really fun surface, and it's probably Asimov's most successful pure thriller. Of course, that's probably because, for the vast majority of his career, Asimov wrote more than "just" pure thrillers, but there's nothing wrong with being workmanlike if you're a really good workman. With Foundation and Earth, I don't think Asimov could even claim to be that, and my reasons for liking it as much as I do are mostly idiosyncratic. But Prelude to Foundation feels like the one time where Asimov's style trumped his substance. I feel queasy even writing that, but there it is. This, I think, is another reason why it's so hard to pick up on what makes Prelude so enjoyable. This isn't a book I'd recommend for someone wanting to explore some of the most brilliant ideas in the history of science fiction — this is a book I'd recommend to someone looking to pass the time on a lengthy cross-country flight. You go back to the Streeling section, and I think there's some interesting stuff there about academic rivalries and reputations, and it's kinda cool that Asimov doesn't resolve the mystery about the meteorology professor's culpability, but still...there aren't any ideas here that Asimov hadn't explored before, and in a more interesting way. At least Prelude is a compendium of dozens and dozens of random Asimov ideas and curiosities, but none of them — except perhaps the Mycogen sector and the explanations of how Trantor works — feel very well-realized. Actually, I take that back — the Dahl knife fights are pretty damn awesome. But they also feel pretty far away from what interests me about Asimov in the first place. I'm clearly running into the same problem that you are — it's really hard to praise Prelude to Foundation without sounding like I hate it. So here's the takeaway, I guess: If everything I've just described sounds bad, then that's just an even greater tribute to the fact that Asimov's writing is enough to overcome all of it and craft an extremely entertaining book. It's a page-turner, to be sure, but it's a superior page-turner, and I think it's OK if Asimov has one or two of those in his corpus. I think I'll leave it at that, not that the reveal is all that great or surprising — especially considering that it's followed by another, bigger reveal that is surprising, but still an eye-roller. One problem with Foundation and Earth and this book is that, from the outset, the Foundation stories thrived on revelation: the sudden reversal of power in "The Mayors," the identity of the Mule, the true location of the Second Foundation, the history of Gaia. But in these last two books we've covered, the revelations are just not especially momentous; in fact, the final curtain lifts in both Earth and Prelude to reveal exactly the same thing. Which I hope doesn't take the wind out of your sails, as I know it's among the things you want to discuss. AW: Like you say, the final reveal of Prelude to Foundation is exactly the same twist as Foundation and Earth...except, I'd argue, ratcheted up another few levels of insanity, and thus rather more enjoyable. So yes, let's venture into spoiler territory by revealing that, once again, R. Daneel Olivaw is waiting at the end of this book. In fact, he's been there all along, in the guise of intrepid reporter Chetter Hummin — which the internet confidently tells me is a corruption of "Cheater Human," which I suppose is just the right level of silly for late-period Asimov — and the Emperor's most loyal and mysterious aide Eto Demerzel. "Come on, Demerzel. If we heard of the paper, so could Wye. If we see the possible importance of Seldon, so could Wye." "If that should happen," said Demerzel, "or even if there should be a reasonable chance of is happening, then we would be justified in taking strong measures." Demerzel said cautiously, "It might be argued that rather than have Seldon in Wye's hands, we might prefer to have him in no one's hands. To have him cease to exist, Sire." "To have him killed, you mean," said Cleon. "If you wish to put it that way, Sire," said Demerzel. What might seem like Demerzel's weaselly refusal to admit his murderous intentions becomes, upon rereading, Daneel trying like mad to discuss assassinating a human without violating the First Law. I can't imagine this is all that riveting to people who aren't massive Asimov fans, but I've already made it plenty clear that I'm a sucker for this sort of thing, and it's great to see that Asimov really does play by the rules. What I love about his plot twists is that they generally work on a couple of levels — beyond the initial shock, they tend to make good sense in terms of the larger story, and there's even a little dramatic irony thrown in that you can pick up on rereading. Since Daneel was more or less crowbarred into Foundation and Earth, there's not much of that on display, but in Prelude to Foundation there's a lot of fun to be had with Hummin and Demerzel's attempts to pass convincingly as humans. You mention Neil Gaiman's work as an example of what Prelude to Foundation could have been, and that's an interesting comparison, particularly when we consider the timeframes involved. We have to get into purely hypothetical territory here, but I suppose, in a perfect world, this is the book Asimov wrote almost immediately after finishing off the original Foundation stories, or at the very latest during his mid-'70s creative resurgence that gave us The Gods Themselves. By the late 1980s, Asimov had become such a fundamentally different writer than what he had been in his early career — an inferior one, yes, but there were also major stylistic differences quite apart from the relative quality of his output — and this is probably about as much as we could expect from a prequel. Asimov probably would have done better to just push ahead with another sequel to Foundation's Edge, where at least his massively different style felt in keeping with the evolving nature of the Foundation universe. Here, just a few decades before the opening stories of Foundation, it feels like a poor fit, and it does no favors for the heftiness of what is essentially a globetrotting action romp. And yet, for all its quite tangible faults, I enjoyed the hell out of Prelude to Foundation, and it's probably the one Foundation book that would actually work well as a movie, although that might actually be the most cutting critique of all, even if I don't mean it to be. (Admittedly not immediately giving away the whole Daneel/Hummin/Demerzel thing would be rather tricky in a visual medium.) This is a fun, fast-paced book, but we haven't spent the last several decades of our lives (I'm estimating) discussing this saga because they're fun and fast-paced, now have we? I'll admit that Foundation and Earth doesn't really succeed in capturing the big ideas and grand sweep of the original trilogy or Foundation's Edge, but at least it was trying. With Prelude to Foundation, it's difficult to say even that much, and that's a shame. But hey, there's still Forward the Foundation. Shall we? "Blogging the Hugos" is a series examining the Hugo Award–winning novels in (more or less) chronological order. 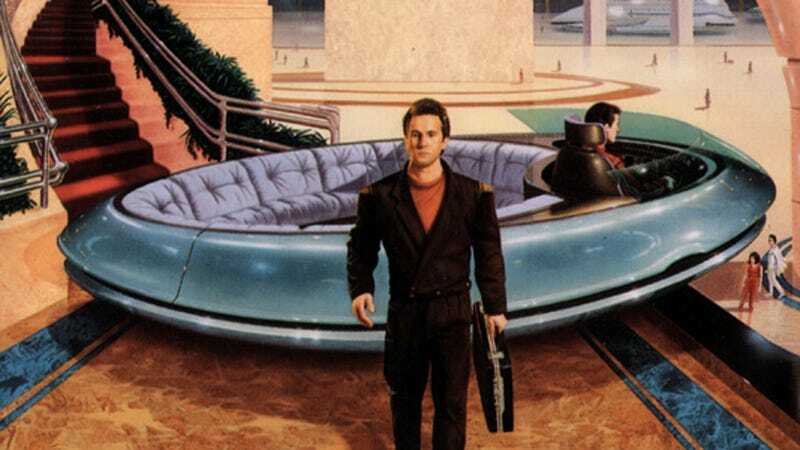 Coming tomorrow: the last book Isaac Asimov ever wrote, Forward the Foundation, from 1993 — which didn't win a Hugo but which has a whole bunch of close relatives that did. Subscribe to the RSS feed and follow @blogginghugos on Twitter for updates. Josh Wimmer is a freelance writer in Madison, WI. Alasdair Wilkins lives in Los Angeles and is a reporter for io9.